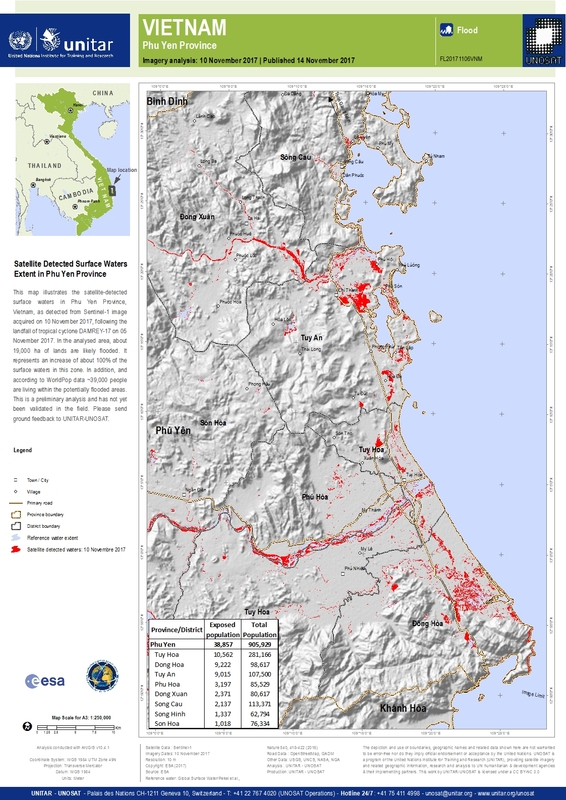 This map illustrates the satellite-detected surface waters in Phu Yen Province, Vietnam, as detected from Sentinel-1 image acquired on 10 November 2017, following the landfall of tropical cyclone DAMREY-17 on 05 November 2017. In the analysed area, about 19,000 ha of lands are likely flooded. It represents an increase of about 100% of the surface waters in this zone. In addition, and according to WorldPop data ~39,000 people are living within the potentially flooded areas. This is a preliminary analysis and has not yet been validated in the field. Please send ground feedback to UNITAR-UNOSAT.